KNOXVILLE, TN — May 1st will be a year. One year since Ira Grimes got the heart breaking call that his son, Keenan, who had just turned 26 years old, had died from an overdose. Within the last 10 months, Ira Grimes has used his strong faith to turn that painful loss into helping others after a strong directive from the God he serves so faithfully. 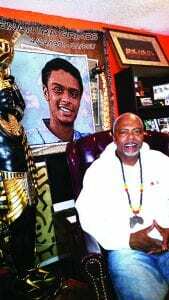 Ira Grimes, Founder of the Keenan Grimes Community Outreach with sons picture in background. When Ira cried out after the death of his son, the first response he received was a deep pain in his chest as God showed him how He felt when His Son died for mankind. Within that message came what would become a life directive for Ira as God told him to go get His people and clear the bridge, “the devils playground”. The bridge is the area where a large majority of the homeless in Knoxville live in tents and camps; many kicked out, unable or unwilling to go into the services provided for those who are willing to go into the different programs or the homeless management systems, due to trust, behavior, or addiction issues. 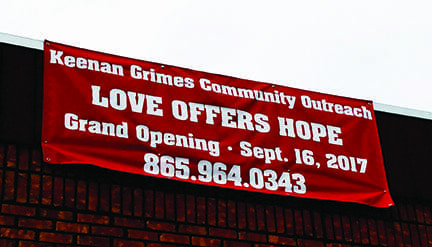 Ira Grimes did not act on the first message but after the Lord told him again, “I need you to go and get my people”, Ira, with only a vacant building he owned, and no money or any provisions; opened the Keenan Grimes Community Outreach on Martin Luther King Blvd in honor of his son, with the goal of saving others from the drugs that took his son. In the six months since the center opened in September, the provision has come. The media has come and done stories about the work being done and daily, there has been a massive outpouring of help from the community. Barbers have come in to give haircuts, citizens, churches, and organizations have donated beds, linens, brand new stove, freezer, refrigerator, clothing and food to sustain the center as they go under the bridge and take in and help those who see no way out. There are no forms to fill out or hoops to jump thru. The only requirement is they go to church and bible study with him and have a desire to rebuild their lives. Ira works to help them get into programs, reunite with family, and get their lives back. The success stories are beginning to roll in with the latest report from a young man reunited with his family in another state who got a job and has pledged to help the center as they helped him. Ira believes you have to put yourself in others shoes. His mantra is “Real People do Real Things and Love Offers Hope”. He opens his heart to the hurting and he ask people every day “Has anyone told you they love you today?”. As he works thru his grief, the one year anniversary of the death of his son is approaching. Ira believes his son is looking down and smiling and would be proud of him.